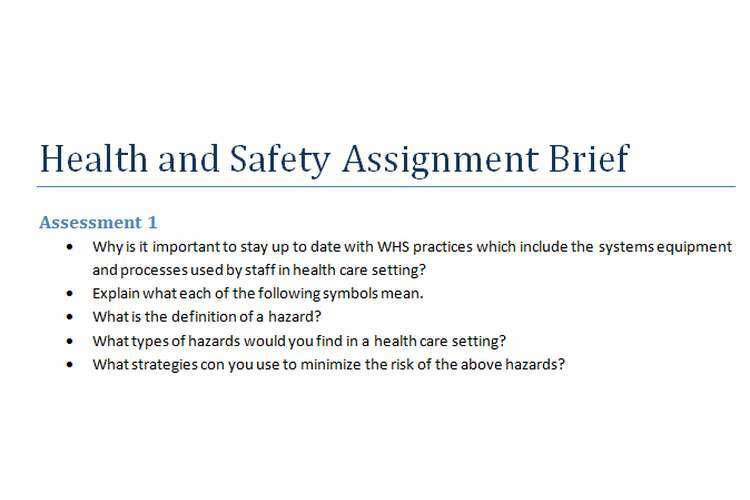 Why is it important to stay up to date with WHS practices which include the systems equipment and processes used by staff in health care setting? Explain what each of the following symbols mean. What is the definition of a hazard? What types of hazards would you find in a health care setting? What strategies con you use to minimize the risk of the above hazards? Outline the process involved in the analysis and management of hazards which is followed by aged care facilities. What safety considerations must you be aware of when working in a home-based care situation and what can you do to ensure your safety? Which WHS/OHS legislation is relevant in your state/territory (Include the applicable state authority and their role). Describe the reasons why it is important to follow this legislation. Detail how the legislation guides your role as a PCW. Chris is a newly appointed Corer who does not respond well to feedback on his work performance. A few of his more experienced colleagues have told him to read and follow client care plans, particularly with regard to manual handling needs. Recently Chris alone was assisting Bill- a heavily built man- to walk to his bedroom after his shower. Bill is usually steady but because of his advanced Dementia he can be unpredictable in his movements: his care plan advises two Careers should walk with Bill alter his shower. On this occasion Bill lost his balance and Chris attempted to soften his fall by lowering him to the ground. This resulted in Chris injuring his back and Bill sustaining a skin tears on his left elbow. What did Chris fail to do? As a result of what occurred (incidents) what reporting procedures does Chris now have to follow for himself and Bal. Using the example template in appendix 1 write a policy and procedure to outline safe work practices for transferring a resident of the floor falling a tall. Refer to the transferring people safely guidelines: Handling patient’s residents and clients in health, aged care, and rehabilitation and disability services. What are two common sources of infection and how can you minimize me transfer of infectious diseases?